There are times in life when a problem evades easy solutions, when you need focused support, or when you want to gain insight into a complex issue. We invite you to look together with us to find God as “a refuge and strength, a very present help in trouble” (Ps. 46:1). The goal of our traininig is to support churches in what they do best — building each other up, reaching out with the message of the Gospel, and bearing burdens in a worshipping covenant community. We currently offer several seminars, but look for formal courses soon. Click here to see the updated 2019 events schedule. 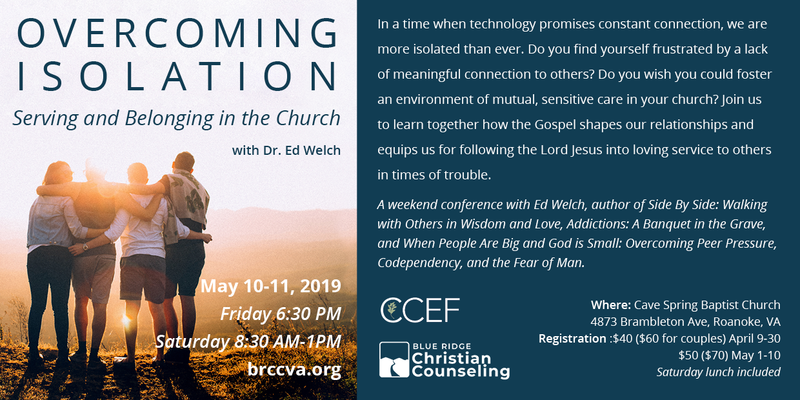 Visit the blog to read the latest news at Blue Ridge Christian Counseling, as well as occasional reflections on topics relevant to the focus areas of our counseling ministry. Ready to get started? Make your appointment today.